ASOS is the world’s most visited fashion website. They shift more than a billion pounds worth of gear a year. That’s a lot of clothes to move, so they need huge teams of people to get this stuff out to customers. But recent news reports have highlighted concerns over working conditions at ASOS’s warehouse – with workers reporting unfair pay and contracts, the level of surveillance they’re subjected to and even toilet breaks being monitored. 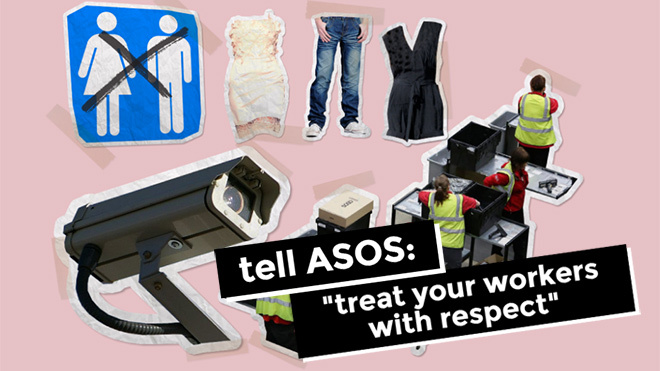 Workers at ASOS need to be treated with basic respect at work. We’re backing GMB, the union for ASOS workers, as they seek to win the changes their members need. ASOS need to listen – and then sit down with GMB to negotiate working conditions that ensure fairness and decency. The company can certainly afford it. Can you help ASOS staff to get the respect they deserve? Note: this campaign is organised and hosted by the union GMB, not by the TUC. Any interaction with the site is conducted with them rather than with us.